It’s Mother’s Day. You’re making breakfast. 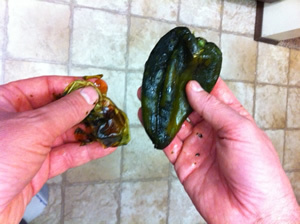 Naturally, it includes freshly roasted Pasilla (or Poblano) peppers. But you don’t have access to an open flame. Enter the trusty toaster oven. Toast the pepper right on the rack of the toaster oven (mine didn’t ooze at all) until slightly charred, about 5-7 minutes. Immediately put pepper in a small bowl and cover with a plate or lid. The pepper will steam itself. Using fingers, remove the skin… it should pretty much slide right off by itself.